Today in Masonic History Samuel Blatchford is born in 1820. Samuel Blatchford was an American jurist. Blatchford was born on March 9th, 1820 in Auburn, New York. He was educated at Columbia College where he graduated from in 1837 at the age of 17. While at college he joined the Philolexian Society a secret literary and debate society and one of the oldest in the United States. In 1840, Blatchford became the private secretary for Governor of New York, William H. Seward. During this same time, Blatchford began reading law before entering into private practice with his father and uncle. In 1854 he moved to New York City where he opened the firm Blatchford, Seward & Griswold. The firm is still in existence today under a different name. During this same time he became known for preparing summaries for the United States circuit court. He also served as the reporter of decisions for the Circuit Court of New York. Just prior to the start of the American Civil War, Blatchford thought he had been given some insider information. With that information he made what turned out to be smart financial decisions and was able to preserve his personal fortune. 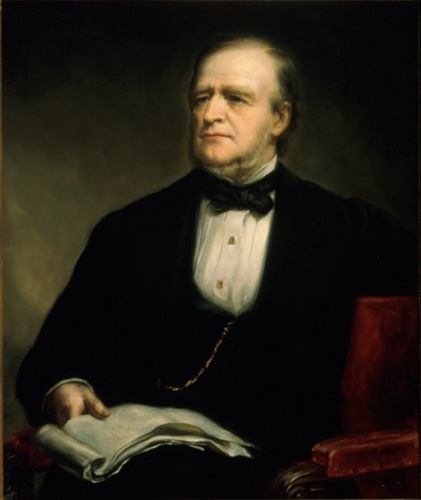 In 1867, President Andrew Johnson appointed Blatchford to the United States District Court for the Southern District of New York. In 1878, President Rutherford B. Hayes appointed Blatchford to serve as as Circuit Judge of the Second U.S. Judicial Circuit. In 1882, President Chester A. Arthur appointed Blatchford to the United States Supreme Court. This made Blatchford the first person to serve on all three levels of the federal court system. On the Supreme Court Blatchford wrote 430 opinions and 2 dissents. Two of his most notable opinions were Chicago, Milwaukee & St. Paul Railway Co. v. Minnesota, and Budd v. People of New York. They are notable because the both deal with due process as spelled out in the Fourteenth Amendment and, according to critics contradict each other. Blatchford passed away on July 7th, 1893. Blatchford was a member of Manhattan Lodge No. 62 in New York City, New York.